Dr. Hitzig has agreed to do a small Q&A here for those interested in knowing more about Acell hair regeneration, plucked Beard Hair Cloning and Platelet Rich Plasma (PRP) hair therapy. Be respectful and stay on topic. Inappropriate remarks or comments will be removed. Also, while Dr. Hitzig will try to accommodate everybody, he is not obligated to answer every single question posted in this thread. Please raise your questions here, ONLY if they are pertaining to Acell hair regeneration, plucked Beard Hair Cloning and PPR. Q #1: You mentioned in an interview (March 2010) that you intend to publish a scientific article. According to this, when can we expect this scientific article? Q #2: Furthermore, you mentioned in the same interview multiple usage of ACell’s MatriStem. That means, besides “plucked hair duplication” as well as “virgin scalp donor regeneration”, you mentioned also “recipient injections” as well as “a new gel formulation” for the injection in between existing hairs for the same purpose. In the meanwhile, are there any new insights? (Strip-) Scar Repair with help of MatriStem? for the usage of ACell’s MatriStem? Regarding the latest set of pictures published at Hairsite, could you please tell us the dates of each photo (time passed from surgery). Re. those same photos, hairs can be seen growing at the revised scar. What is the origin of these hairs? Could you post a broader before photo, to assure that is the same patient as in the after photos? As soon as you and Dr. Cooley confirm the durability of the Acell-autocloning method, do you intend to make any full restauration of a very bald person, to demonstrate the potential of that method? » Platelet Rich Plasma (PRP) hair therapy. » regeneration, plucked Beard Hair Cloning and PPR. The obvious question is: When is it gonna be available? » The obvious question is: When is it gonna be available? I want to try the plucked hair cloning using my beard, can I just sign up as a test patient, is there a fee? I have seen many examples of using Acell to reduce strip scarring that results from harvesting donor hair for transplants. But do you think we may soon use Acell to regrow hair in donor areas that were harvested by the old punch graft method? 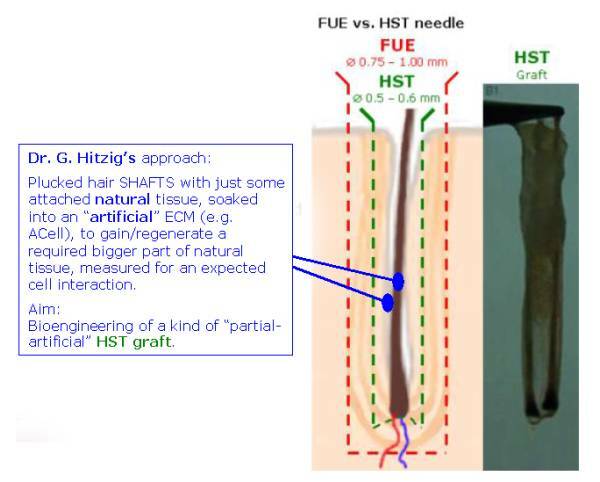 For example, in the presentation Dr. Cooley made to the IHRS, there was a slide showing what I understand to be the formation of new hair follicles in an old circular punch graft scar. » » The obvious question is: When is it gonna be available? Spanish Dud, are you Dr. Hitzig ?? Yes, look at Cooley’s part II. 1.-There is no scar tissue. It feels like normal skin. 3. It grows new hair, although this hair is finer than normal, and we don’t know how long it will last. This presumably applies too for 5mm punches, as long as there are transections at the edge. » » Platelet Rich Plasma (PRP) hair therapy. » » regeneration, plucked Beard Hair Cloning and PPR. » results from harvesting donor hair for transplants. » were harvested by the old punch graft method? » in an old circular punch graft scar. But I was hoping Hitzig might have more info on it. BTW, as for the fineness of the hair shown growing in the punch sites in Cooley’s slide: if I remember correctly, those new hairs were still short, so they might be fine simply because they are so new. Even when normal new hairs first start growing, they are so fine as to be almost invisible to the casual observer. It’s not until they get to be about a half inch long that they start to become easily visible, because their diameter has increased enough down towards the base for you eye to notice them. Think of ear hair. One day you look for any hair growing from your ears to trim, and you see nothing. A day or two later, you look again, and suddenly you notice one or two long hairs growing from your ear. Their length means they were there the last time you looked, but their diameter then was still to fine for you to easily notice them. So if I’m interpreting Cooley’s slide correctly, it’s very possible the hairs growing in those punch sites will increase in diameter as they continue to grow. » Yes, look at Cooley’s part II. » 1.-There is no scar tissue. It feels like normal skin. » 2. It is pigmented. » don’t know how long it will last. » transections at the edge. » » » Platelet Rich Plasma (PRP) hair therapy. » » » regeneration, plucked Beard Hair Cloning and PPR. » » results from harvesting donor hair for transplants. » » were harvested by the old punch graft method? » » in an old circular punch graft scar. @HairSite, sorry for the “stupid question”, but do you mean Dr. Hitzig himself (as a registered HairSite user) will be answering questions here? IF so, I guess many users would WELCOME such an initiative by Dr. Gary Hitzig, because Dr. Hitzig has so far the most experience with ACell and its usage. » post your questions directly to Dr. Hitzig there. Thanks for the ‘homage’ Spencer Kobren! Yes, it is possible. Maybe they need to grow a little more length to show the real caliber. we will see. This punch harvesting method is very promising because you get completely normal FUs for grafting, and these are DHT resistant with no doubt. These will endure in the recipient site (while the pkucked hairs we don’t know). So, if the punched donor sites regenerate with solid hair, that would be great. The plucking method is less invasive and probably faster, but we will see if the hairs are durable. » I know–I saw that. » But I was hoping Hitzig might have more info on it. » so they might be fine simply because they are so new. » to trim, and you see nothing. » » Yes, look at Cooley’s part II. » » 1.-There is no scar tissue. It feels like normal skin. » » 2. It is pigmented. » » don’t know how long it will last. » » transections at the edge. » » » » Platelet Rich Plasma (PRP) hair therapy. » » » » removed. » » » » regeneration, plucked Beard Hair Cloning and PPR. » » » results from harvesting donor hair for transplants. » » » were harvested by the old punch graft method? » » » in an old circular punch graft scar. » the real caliber. we will see. » will endure in the recipient site (while the pkucked hairs we don’t know). Bravo Spanish Dud, you’ve got it! than actually discribed by himself ? Because this has a specifically reason(s)! I don’t think he is talking about using PRP alone but in conjunction with Acell injections to reverse the miniaturization process of your existing hair. This would be a huge development if it worked consistently. Will any doctor be available to perform surgeries with ACell to make “HM”? Will this increase so much the price, or will keep the same (since the effort is not really different, if less)? Actually I’m interested in this but you’re not offering any guarantee if it’s working or something, and I understand it’s hard to say nowadays. How much time do you estimate to get a surgery (if it really works) with ACell with real guarantees? » publish a scientific article. » According to this, when can we expect this scientific article? » - Beard/Scalp hair “AutoCloning”? » - (Strip-) Scar Repair with help of MatriStem? » for the usage of ACell’s MatriStem? I am currently doing a Scientific Article that I am working on with several researchers with experience in both Technical and Practical use of ACell. It is ntering its final stages. We have tried our best to update it as its gone along to help reflect the latest techniques , technology, and information. When the article is submitted, it takes a bit of time until the journals will publish it. We temporarily have abandoned the use of the gel, as we have found that mixing ACell with spun down arterial seryum or PRP to be more benficial. Both contain adult stem cells which become reactivated and become progenitor cells. Upon mixing then can be injected into the target recipient area. We are now beginning to test to compare injections of PRP -vs-PRP + ACell into thinning scalp areas as early evidence suggests we maybe able to slowdown or stop hair loss and perhaps reverse minaturizing hairs. 3. The costs are determined on a case by case basis, usually scar repairs are combined with additional Hair Transplant procedures. 4. Yes, infact Dr. Cooley is already doing this and we will be participating with is shortly. » please tell us the dates of each photo (time passed from surgery). » 2. Re. those same photos, hairs can be seen growing at the revised scar. » What is the origin of these hairs? » patient as in the after photos? » very bald person, to demonstrate the potential of that method? Please refer to my slide presentation (HairSite to post shortly), where you can see dates that are specifically shown. In addition the pictures are better indictive of it being the same person/patient. the hairsite scar photos were posted as an example of showing healing of a revised scar with ACell Only. Please understand that healing in the scalp involves biological creep (formationof new tissue) the ACell works by directing new tissue to be a copy of the original rather then scar formation. 4. I think first we will be working in limited bald areas, cause auto - cloning at present time is an extremely tedious procedure and has been reserved for people with limited donor area remaining. 5. The availability is Now, but as long as the patient is a suitable candidate. » as a test patient, is there a fee? We currently have a list of candidates we are working with. If you are interested please email us directly at Dochitzig@aol.com with pictures of your hair loss situation and we can discuss it seperatley.